We are happy to announce the Call for Papers for the “Living Communities and Their Archaeologies: From the Middle East to the Nordic Countries” conference (LiveArch2019), hosted at the University of Helsinki, from Thursday 12 September to Saturday 14 September 2019. Paper proposals can now be submitted via the EasyChair CFP platform: https://easychair.org/cfp/LiveArch2019. Please note that the deadline for submission is 30 April 2019. The “Living Communities and Their Archaeologies” conference welcomes presentations addressing the fundamental issue of what we understand as “community archaeology”. This seemingly simple question refers both to the “communities” and the “archaeologies” concerned, and to the interrelations between them. Which communities are we addressing when doing community archaeology (and which are ignored)? What approaches to archaeology do we employ? Is it only excavation, does community archaeology end when the excavation season is over? How do we affect the community in which (or with which) we work? How does the community affect us, the archaeologists? And how can we measure and explain success or failure of “community archaeology” projects? These questions are still to be expanded upon within the contexts of Middle Eastern archaeology and archaeology in the Nordic and Baltic countries. The aim of this conference is to think critically about relationships between communities and archaeologies theoretically as well as by discussing practical cases from cultures that are quite different from each other. 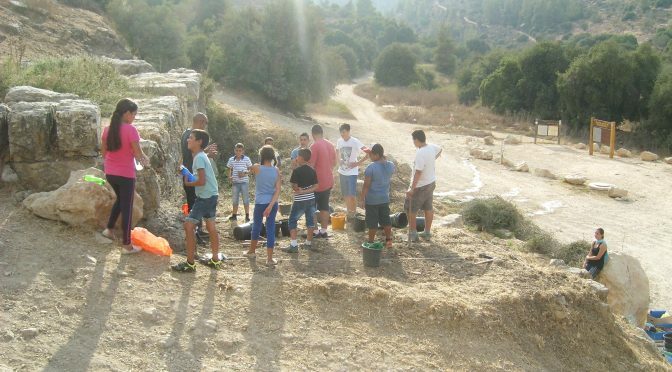 Measuring the success and failure of community archaeology. We are happy to emphasise that accommodation cost for the full duration of the conference will be covered by the organisers for all presenters whose papers are selected. Photo courtesy of G. Sulymani. “Mitä Raamatussa sanotaan sukupuolista ja sukupuolielämästä, miehistä ja naisista? Miten erilaiset käsitykset sukupuolesta ilmenevät paitsi Raamatussa myös muissa aikalaislähteissä? Entä mitä näistä muinaisista lähteistä voidaan sanoa sukupuolentutkimuksen valossa? Sukupuoli Raamatun maailmassa esittelee raamatuntutkimuksen ja sukupuolentutkimuksen leikkauspintoja suomalaiselle yleisölle. Kirja on ensimmäinen suomenkielinen Raamattua ja sukupuolentutkimusta käsittelevä yleisteos. Se soveltuu sekä aihepiiriin perehdyttäväksi oppikirjaksi että muille aiheesta kiinnostuneille. Kirjan toinen toimittaja Elisa Uusimäki, huippuyksikön tiimin 4 jäsen, vieraili Susanna Asikaisen kanssa Vanhojan ja Nikin kirjapodcastissa puhumassa kirjasta ja sen käsittelemistä teemoista. 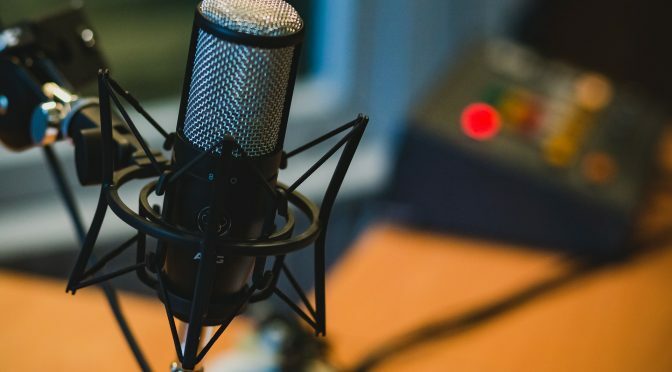 Podcastin voit kuunnella täältä. Kirjan voi hankkia itselleen Tiedekirjan verkkokaupasta. How does the concept of cultural evolution relate to biblical studies? 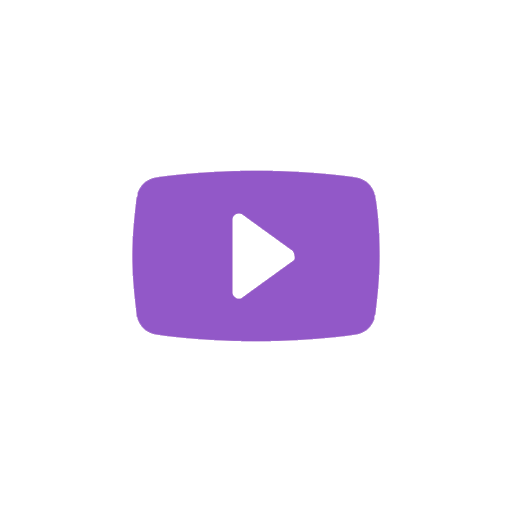 Elisa Uusimäki, a post-doctoral researcher from CSTT team 4, produced an interview about the topic to the European Association of Biblical Studies (EABS) digital video platform Scholars’ Corner. The interview features Petri Luomanen (University of Helsinki), his team, and Armin Geertz (Aarhus University). You can watch the interesting 30 minutes interview below. 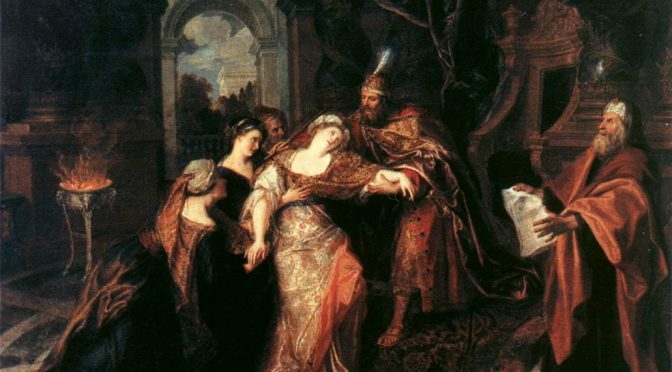 The call for papers for the conference “The Strange and the Familiar: Identity and Empire in the Ancient Near East”, University of Helsinki, August 22-29 (2019) is now open! This conference analyzes the interaction of identity and empire in the ancient Near East during the second and first millennia BCE. Identity is often created through contrast with the foreign or unfamiliar, and this conference considers how the frontier and the lands and peoples beyond it could be used as that marker of “otherness” necessary for identity construction. Empires could, and did, alter the identity of the areas and peoples under their imperial dominion, but they did not emerge from such new encounters completely unchanged. Instead, interaction with the other can similarly alter the identity of the imperialists. How do empires construct their own internal and external identity? How are the borders of empire constructed and defined? How may a border be considered not only geographically, but also culturally, legally, and politically? What mechanics of power are employed by the empire to control its more peripheral regions? How is this control represented across textual genres? How can we trace the impact of empire in the areas under imperial control? What can other avenues of evidence, such as archaeological and material finds, tell us about the influence of empire on identity? 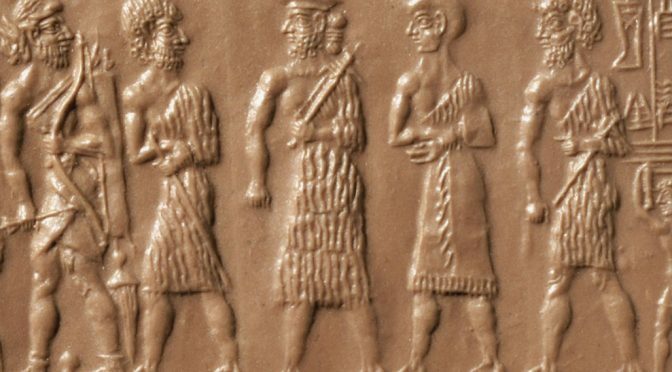 The conference invites papers that consider such questions, as well as the more general topic of identity and empire, in the context of the areas that lie within the broad heading of the ancient Near East. This includes papers that examine empire in the context of Assyria and Babylonia; the interactions between Mesopotamia and Egypt; connections between Mesopotamia, the Levant, and Eastern Mediterranean; and the impact of empire on the historical context of the Hebrew Bible. Papers may evaluate the conference topic from the perspective of textual, archaeological, or art historical methods, and papers combining such approaches, or integrating anthropological or sociological methodologies, are particularly welcome. Funding has been secured to cover the cost of housing for conference speakers, with further funds dedicated to defray, if not entirely cover, the cost of travel to Finland. The organizers welcome proposals from scholars outside of Europe, but regret that the available funding may not be able to fully cover the cost of transatlantic or similarly long-distance flights. This conference is hosted by the University of Helsinki Center of Excellence: Changes in Sacred Texts and Traditions; the Center of Excellence: Ancient Near Eastern Empires, and the Finnish Institute for the Middle East. Paper proposals of up to 350 words should be sent to Gina Konstantopoulos (gina.konstantopoulos@helsinki.fi) by March 15 2019. Any questions may also be sent to Gina Konstantopoulos. “Septuagintan eli Vanhan testamentin kreikankielisen käännöksen tutkimus Helsingin yliopistossa on maailmankuulua. Miksi ja miten pyhät kirjoitukset käännettiin? Kuinka Septuagintaa ja sen kääntäjiä tutkitaan? Entä mikä merkitys teksteillä oli varhaisille kristityille ja Uuden testamentin kirjoittajille? Haastattelussa hiljattain ilmestyneen perusteoksen “Sisälle Septuagintaan” toimittajat emeritaprofessori Anneli Aejmelaeus, tutkijatohtori Katja Kujanpää sekä yliopisto-opettaja, tohtorikoulutettava Miika Tucker. Vanhojan kirjapodcastissa on vieraillut myös muita huippuyksikön tutkijoita ja käsitelty useita ajankohtaisia eksegeettisiä aiheita. Tutustu podcastiin tarkemmin täältä. Video: Miten Raamatun muutoksia tutkitaan? Miten Raamatusta tuli Raamattu? Miten Raamatun muutoksia voi tutkia tieteellisesti? Miten varhaiset tekstien tulkitsijat ratkaisivat luomiskertomusten ristiriitaisuuksia? Huippuyksiköt “Pyhät tekstit ja traditiot muutoksessa” ja “Muinaisen lähi-idän imperiumit” ovat tuottaneet yhdessä neliosaisen videosarjan, jossa esitellään ajankohtaista muinaisen maailman tutkimusta. 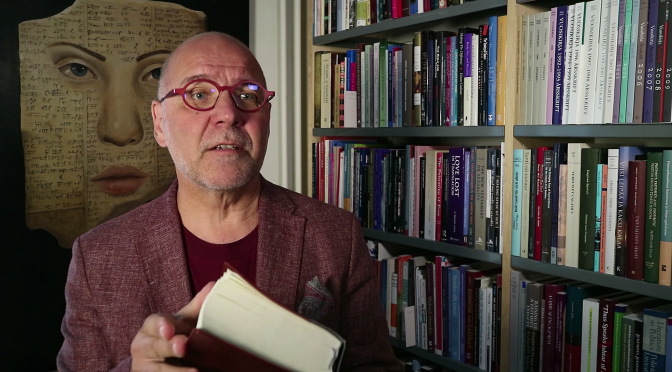 Sarjan ensimmäisessä osassa Helsingin yliopiston Vanhan testamentin eksegetiikan professori Martti Nissinen ja tutkijatohtori Jessi Orpana kertovat tutkimustyöstään. Videosarjan kolme muuta osaa julkaistaan kevään 2019 aikana. Aiheet vaihtelevat historian tutkimuksen lähtökohdista muinaiseen maahanmuuttoon ja sukupuolentutkimuksen soveltamiseen muinaisen maailman ymmärtämiseksi. Haastatteluja julkaistaan sekä suomeksi että englanniksi ja molemmissa tapauksissa YouTubesta on saatavilla tekstitykset toisella kielellä. For biblical scholars ‘canon’ is usually a matter of literature. However, within a larger cultural context one can speak of a ‘Western canon’ and the highlights of ‘Western’ (a term I won’t problematize here) culture. One can ponder on the possibility of having a canon of children’s literature (e.g., in English) or presenting the most important events and persons of a country’s history as a canon. But if a canon only shows the highlights, to what extent is it representative? Similarly, museum collections or catalogues with replicas tend towards presenting a specific kind of canon. 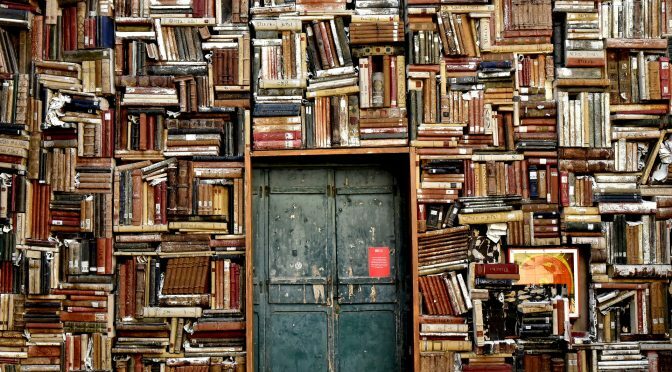 A compendium as a reliable representation of a certain corpus of literature or artefacts; a compendium represents, exemplifies, and gives an over-all impression. An anthology choses to represent, in the sense of electing and highlighting items within a corpus. A canon goes beyond election and tends towards exclusion by virtue of what is not represented. Combined with an approach to cultural memory, it shapes the image of a corpus or people’s view of history. What should be included in a canon? Furthermore, what should be included in a canon of the most important events in a country’s history: should one include its success and victories, but also its suffering and even its collective guilt? 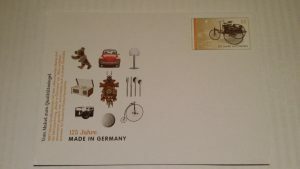 A commemorative envelope (figure 1) was issued in celebration of the German success following the British ‘Merchandise Marks Act’ (issued 125 years ago in 2012) with the slogan ‘vom Makel zum Qualitätssiegel’. This Act caused that products marked with ‘made in Germany’ were not branded (in the sense of stigmatized as inferior; cf. Makel) but the brand ‘made in Germany’ grew into a seal of quality. The envelope presents several products but only those that are socially acceptable. Thus, military products, for which German was famous too, are left out. This, however, could be justified by pointing out that before World War II we don’t know about German weapons bought by the British. 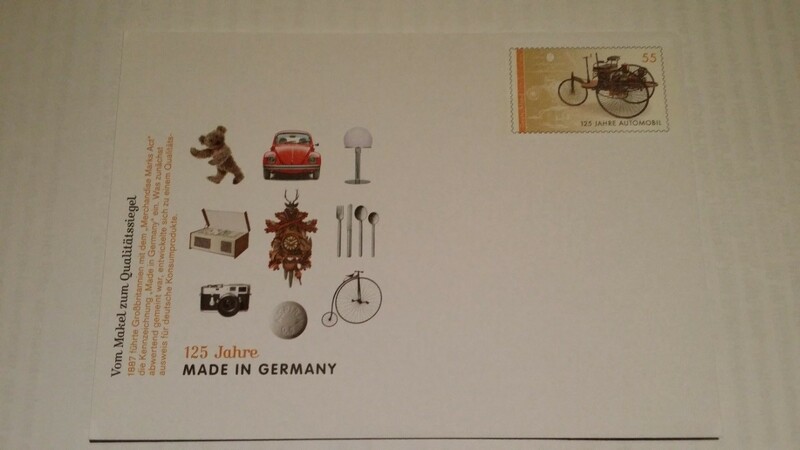 Figure 1: Gedenkbrief (commemorative envelope), issued by the German post (‘Deutsche Post’) in 2012 to commemorate the British ‘Merchandise Marks Act’ of 1887. Source: photo by author (commemorative envelope in the author’s private collection). Further examples may also be found in philately: in honour of 60 years UNESCO, Romania issued a stamp with two figurines from the Hamangia culture (figure 2). How representative are these two figurines of Cernavoda, one of over fifteen sites with remains of the Hamangia culture? Furthermore, to what extent is a complete though non-specific female figurine representative? What about a unique piece like ‘The Thinker’? Exceptional items find a place in the canon by default, but aesthetics also seem to play a role in what is chosen for canonization, as seen here in stamps. This example approaches what I recently called ‘a gynemorphic bias’; coroplastics (figurine studies) often focus on figurines with female (anthropomorphic) forms to the neglect of others, such as animals. Beyond that, when selecting items, complete objects are often favoured. They may well represent past production but fragments are often much closer to actual archaeological experiences in the field. 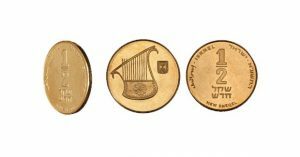 To continue in this line of thought, we may consider the case of the fake seal that inspired the minters to use David’s harp for the half-shekel coin. Even though the seal was a fake, David’s harp was already part of cultural memory (or memories), of one or even several cultural canons. 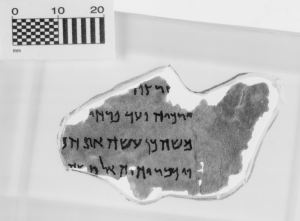 Although even David’s historical ‘proportions’ are debated, the motif of David’s harp was reinforced by the allegedly historical confirmation provided by the seal. 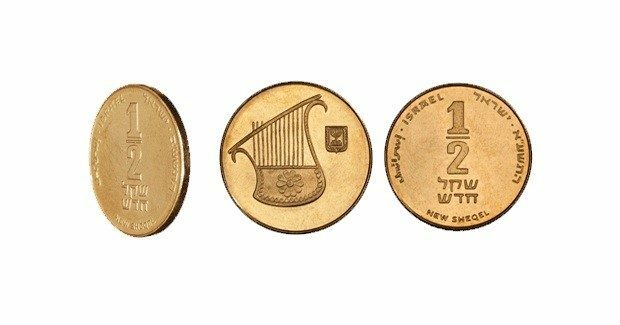 Thus, while the harp on the half-shekel coin may be an apt expression of cultural memory, the harp’s shape, as copied from a doubtful source, also presents as a warning against ideology, taken-for-granted motifs, and too-easily-accepted historical evidence. Izaak J. de Hulster, Figurines in Achaemenid Period Yehud: Jerusalem’s History of Religion and Coroplastics in the Monotheism Debate, Orientalische Religionen in der Antike 26 (Tübingen: Mohr-Siebeck, 2017), esp. 72–78. For this example, I thank Meindert Dijkstra, Palestina en Israël: Een verzwegen geschiedenis (Utrecht: Boekencentrum, 2018), p.21. Present in many different contexts, such as church art – e.g., Rittmarshausen, Germany), see: https://d2r0d2z5r2gp3t.cloudfront.net/page_assets/images/24604/1395176608.lightbox-d6dbf484e87c5ed486894144fdde88b6.jpg (left of the pulpit; accessed 10 September 2018). Why are there so many scriptural quotations in Romans? What functions do they perform in Paul’s argumentation? Does Paul quote accurately according to a wording known to him or does he adapt the wording himself? How does the function of a quotation in Romans relate to the original literary context of the quoted words? In her new book, Katja Kujanpää (Th.D. ), a postdoctoral researcher of the CSTT, seeks answers to these questions. Numerous studies try to describe how Paul read Jewish scriptures. This book focuses on how he uses them. It views Romans as a letter composed to persuade its audience: quotations help Paul to articulate his views, to anchor them in scriptures, to increase the credibility of his argumentation, and to underline his authority as a scriptural interpreter. The book combines modern quotation studies, rhetorical perspectives and careful text-critical analysis of the 51 quotations in Romans. The book shows that Paul actively tries to guide his audience to interpret the scriptural quotations as he wished them to interpreted. 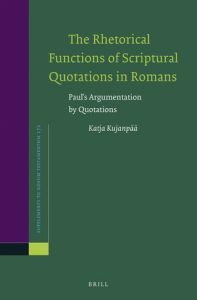 Rather than inviting his audience to an intertextual journey, that is, to listen to scriptures themselves and to reach their own interpretations, Paul actively tries to control the message that quotations have in his argumentation. The book highlights his various strategies in accomplishing this. 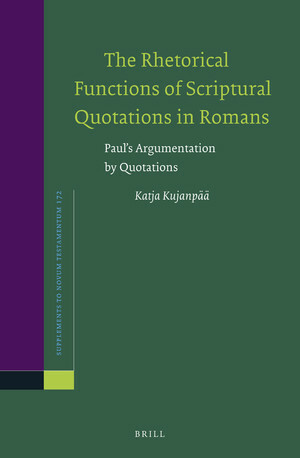 The question concerning the accuracy of Paul’s quotations is important, since deliberate modifications may reflect Paul’s intention and reveal what he wishes to communicate with the quotation. As the Introduction of the book shows, knowledge of the Septuagint studies and of the textual plurality of the first century CE are crucial for this question. 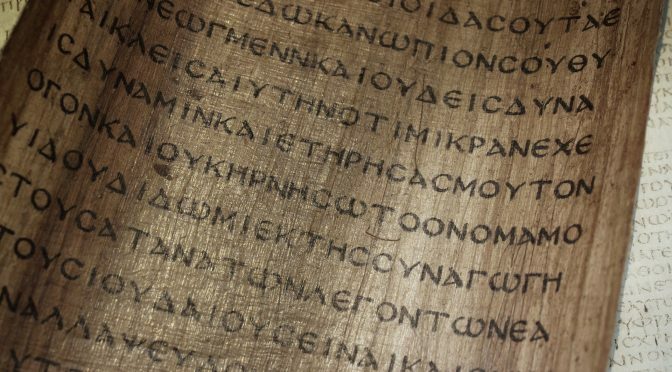 Combining rhetorical matters with close textual study results in a more comprehensive picture of quotations in Romans than has been previously seen. Thus, the book opens new perspectives on Paul’s argumentation, rhetoric and theological agenda. 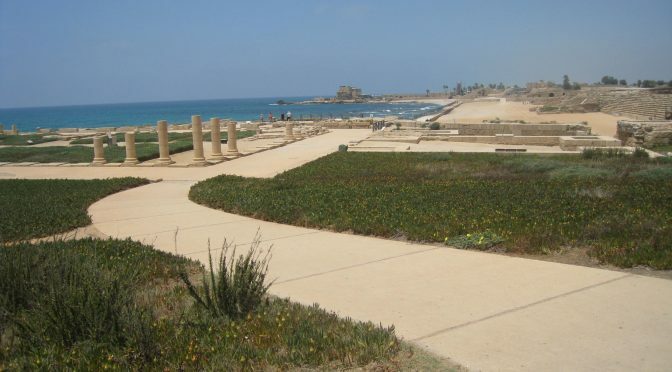 The workshop is organized by the Globalization, Urbanization and Urban Religion in the Eastern Mediterranean in the Roman and Early Islamic period workshop series, funded by The Joint Committee for Nordic research councils in the Humanities and Social Sciences (NOS-HS) and by the Academy of Finland Centre of Excellence Changes in Sacred Texts and Traditions, Faculty of Theology, University of Helsinki. The workshop is the first in a series of three workshops organized jointly by the University of Helsinki (Raimo Hakola, Rick Bonnie), Aarhus University (Rubina Raja) and the University of Bergen (Simon Malmberg, Eivind Heldas Seeland). The program of the workshop can be found using the following link: https://blogs.helsinki.fi/sacredtexts/files/2018/10/Helsinki-workshop_schedules-29102018.pdf. For further information about this workshop, please email raimo.hakola@helsinki.fi and/or rick.bonnie@helsinki.fi. Onko väitettyjen Qumranin tekstifragmenttien epäaitous nyt osoitettu? 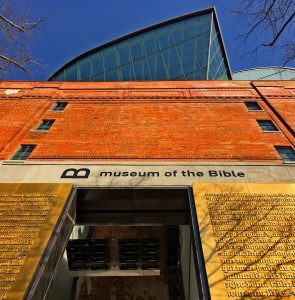 Maanantaina 22.10.2018 Washingtonissa sijaitseva The Museum of the Bible antoi lehdistötiedotteen, jonka mukaan vuonna 2017 Berliiniin testattavaksi lähetetyistä fragmenteista on tullut tulokset ja niiden perusteella viittä museon hallussa olevasta 16 fragmentista on syytä epäillä väärennöksiksi. Museo poistaa kyseiset fragmentit näyttelystä ja loputkin fragmentit ilmeisesti tutkitaan. Lehdistötiedotteessa ei kerrota, mitkä testatut fragmentit ovat, mutta tieto löytyy kohdasta ”Provenance”. Tärkeää on se, että museo on ryhtynyt toimenpiteisiin ja ottanut vakavasti sen mahdollisuuden, että se on käyttänyt satoja tuhansia dollareita(?) roskaan ja rikollisesti tuotettuun tai välitettyyn materiaaliin. Mikä uutisessa yhä vaivaa tutkijoita? Ensiksi, suurin ongelma, josta museota on laajemminkin kritisoitu, on dokumentaation puute: jos esineet on laillisesti hankittuja ja maahan tuotuja, museon pitäisi pystyä osoittamaan esineiden alkuperä laillisin dokumentein. Sivuillaan museo kertoo esittävänsä kunkin esineen alkuperän ja tiedot avoimessa tietokannassa, mutta ainakaan vielä näistä fragmenteista ei anneta tietoa. Fragmenteista kerrotaan ainoastaan ostopäivät ja paikka, mutta tämä ei ole riittävää. Toiseksi, museo ei paljasta mitkä tekijät ovat syynä väärennösepäilyyn. Se vetoaa siihen, ettei väärentäjille haluta antaa tarkkaa tietoa, joka voisi auttaa uusien väärennösten tekemisessä. Tutkijoiden näkökulmasta tällainen tieto kuuluu tiedeyhteisön arvioitavaksi – ja ehkä se ajallaan sinne myös ilmaantuu. Mikään yksittäinen kriteeri ei riitä osoittamaan hyvin pieniä tekstifragmentteja väärennöksiksi, sillä materiaalia on yksinkertaisesti liian vähän. Väärennösepäilyjen tutkimisista ja erilaisista kriteereistä käytiinkin vuonna 2017 vilkasta keskustelua (ks. Kuka väärentää Qumranin tekstejä?). Alkuperältään epäselviä fragmentteja ei yksinkertaisesti voi osoittaa tieteellisin keinoin väärennöksiksi sen kummemmin kuin aidoiksikaan, mutta nyt esitettyjen epäilysten vuoksi kaikkien vuoden 2002 esille tulleiden, yksityiskokoelmiin hankittujen fragmenttien päällä lepää raskas varjo. Luulisi myös, että markkinat olisivat väärennösepäilyjen vuoksi viilentyneet – mutta niin kauan kuin joku on valmis maksamaan alkuperältään epäselvistä esineistä, väärentäjillekin on töitä. Kiistelty Museum of the Bible Washington DC:ssä (Kuva: Ron Cogswell). Kolmanneksi, museo puhdistaa mainettaan tekemällä yhteistyötä tutkijoiden kanssa. Kipp Davis, joka oli mukana julkaisemassa fragmentteja mutta joka myös esitti niistä epäilyksiään (samoin kuin toisen, Martin Schøyenin kokoelman joistakin fragmenteista), on kutsuttu jatkamaan tutkimustaan. 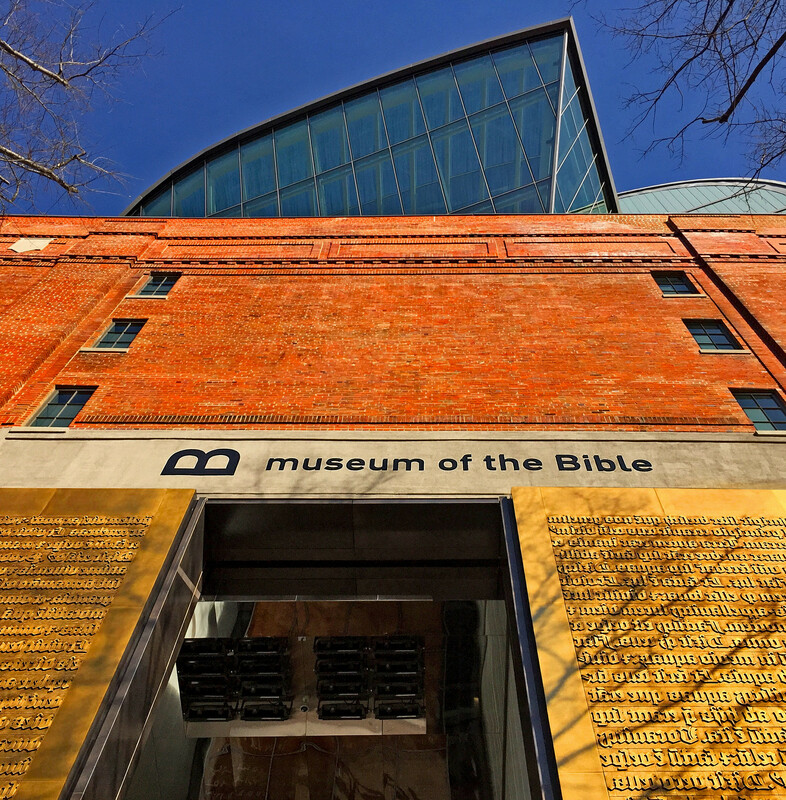 Candida Moss ja Joel Baden kirjoittivat viime vuonna teoksen Bible Nation (Princeton University Press 2017), jossa he paitsi koettivat ymmärtää Greenin perhettä museon taustalla ja muita kokoelman hankintoihin osallistuneita henkilöitä, myös kritisoivat museon toimintatapoja. Yksi seikka erityisesti koskee tutkijoiden osallisuutta. Greenin perhe aloitti vuonna 2010 niin kutsutun Green Scholars Initiativen, joka nyt tunnetaan nimellä Scholars Initiative. 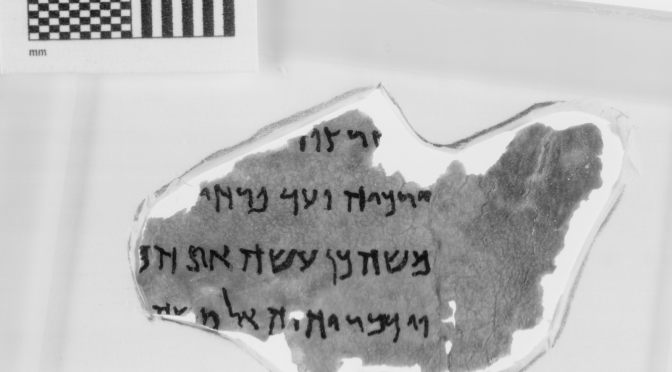 Myös ensimmäiset museon Qumran-fragmentit on tieteellisesti julkaistu Brillin kustantamana tässä ohjelmassa: Emanuel Tov, Kipp Davis, and Robert Duke, eds. 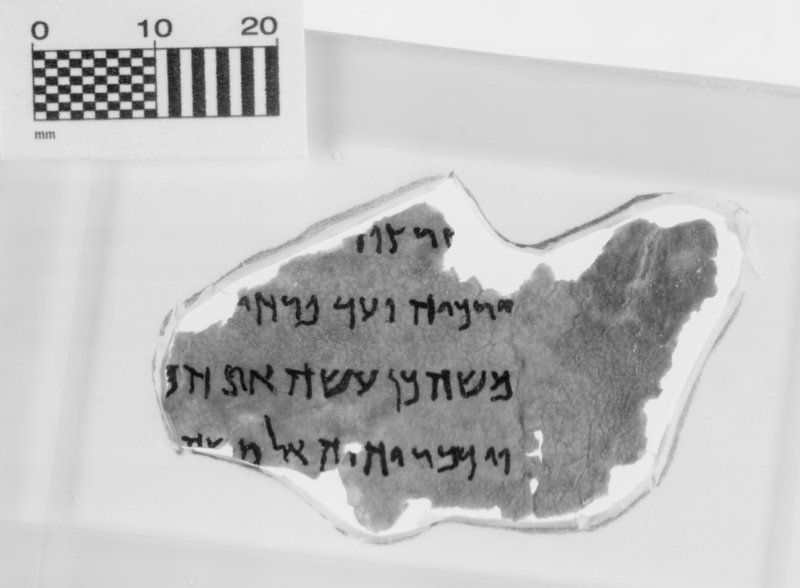 Dead Sea Scrolls Fragments in the Museum Collection, Publications of the Museum of the Bible 1 (Leiden: Brill, 2016). Tekijöinä ja avustajina on lukuisia opiskelijoita eri yliopistoista ja instituutioista. Moss ja Baden esittävät, että Steve Green on toiminut kuten kuka tahansa liikemies: muinaislöytöjä on saatettu hankkia edullisesti, mutta kun esine on lahjoitettu (yleishyödylliselle) museolle, esineen arvo onkin ollut aivan toinen kuin siitä maksettu hinta ja näin on saatu maksimaaliset verovähennyshyödyt. Mitä väliin tarvitaan? Tutkijoita, jotka osoittavat esineen merkityksen – eivät välttämättä edes sen aitoutta tai mielenkiintoisia piirteitä. Riittää, että tutkijat ovat tutkineet tekstipalasta niin että esineen ”ansioluetteloon” voidaan liittää tutkimusta osoitukseksi esineen saamasta mielenkiinnosta. Kun tutkijat kutsuvat ohjelmaan mukaan opiskelijoita, joilla ei voi olla sitä tietoa ja kokemusta jota vanhemmilla tutkijoilla on, tilanne voi olla tutkimuseettisesti varsin kyseenalainen: kenelläkään ei ole täyttä tietoa esineiden alkuperästä, mutta kukaan ei ota täyttä vastuuta sen selvittämisestä, ja opiskelijat voivat huomaamattaan joutua nykyiseen tilanteeseen: olla osallisia väärennösten julkaisemiseen. Tällaisten ongelmien ehkäisemiseksi tarvitaan tutkijayhteisön valppautta mutta myös yhteisiä käytänteitä, joihin voidaan vedota niin ettei yksittäinen tutkija joudu punnitsemaan opiskelujensa tai uransa etenemisen ja moraalisesti arveluttavien valintojen välillä. Viime kesänä tehty kyselytutkimus Qumran-tutkijoiden keskuudessa osoitti, että vaikka käytänteet eivät estäisi Lähi-idän kulttuuriperinnön laitonta kauppaa, ryöstelyä ja väärennöksiä, ne voivat ainakin selventää tutkijoille, millaisia kysymyksiä heidän on syytä kysyä, jos he kohtaavat muinaisiksi esiteltyjä esineitä. CSTT loi viime vuonna sitä ohjaavat käytänteet. Kirjoittaja on Vanhan testamentin eksegetiikan ja lähialueiden professori Helsingin yliopistossa ja huippuyksikön tiimin 4 johtaja. Hänen tutkimuksensa on keskittynyt erityisesti Kuolleenmeren kääröihin.